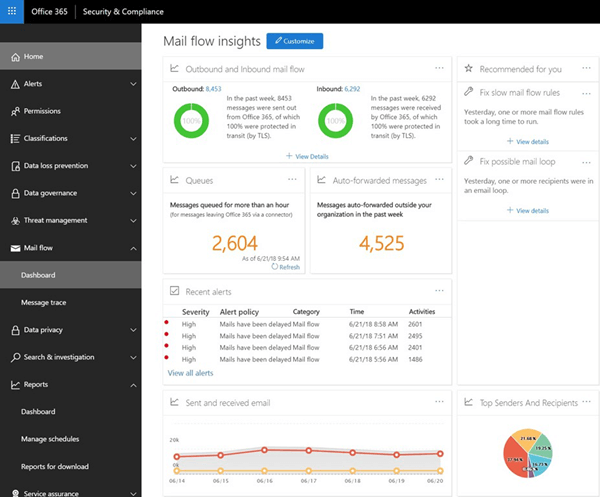 Admins can use mail flow dashboard in the Security & Compliance Center to discover trends, insights and take actions to fix issues related to mail flow in their Office 365 organization. Members of the Office 365 global administrator role. Members of Office 365 Exchange administrator role. The user must log in to the Security & Compliance Center directly at https://protection.office.com. The user will only have read-only permission to the mail flow dashboard. The user won't have access to the Office 365 admin portal. For more information about the Office 365 global administrator role, see About Office 365 admin roles. For information on assigning Security & Compliance Center roles to users, see Give users access to the Security & Compliance Center. Go to the Security & Compliance Center at https://protection.office.com. Expand Mail flow and then select Dashboard.